Old chapalang bike is kept outside. 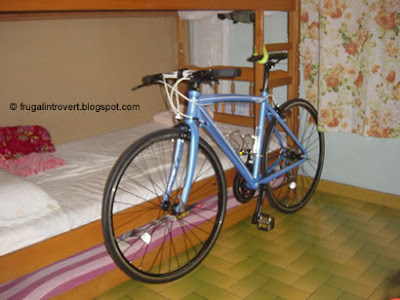 New bike kept in bedroom right beside the bed to save space since it doesn't matter much if 1 side of handlebar & a pedal 'protrudes' onto the bedside during sleep. An elastic strap is slinged over the saddle to prevent it from falling over. I've seen people posting pics of how they store their multiple bikes at home & gosh it sure does take up much space especially in pigeon hole flats. Nowdays peoples' homes are more & more cluttered with posessions(including mine). The stuff that took up the most space for me are my books. Nowadays i seldom buy books unless the book is really good for reference otherwise i'll borrow from library. Is not so much of saving $ for books but more of space storage issue now. Having too much things lying around usually mean more stuff to clean. At times when stuff are discarded away is as though i've cleared up 'mental' space in my mind.